Michael - the father figure. Interests include Aikido and Harleys. Ronda - the woman of the house. Interests include computers and breeding and showing Silky Terriers under the kennel name Ka'Roo. Works at the Alaska Department of Transportation as a Parts Manager. Together we own Iliamna Lock & Key Mobile Locksmith Services in beautiful Soldotna, Alaska. Check it out! Karen - the peon. She likes sports especially track & soccer. 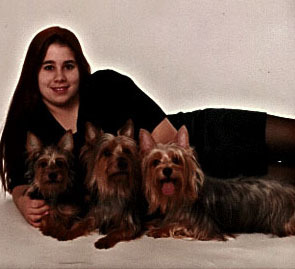 She shows our own dogs as well as others. And of course the members of our menagerie - our show dogs, Max the cat, African Hingeback Tortoise, parakeet and bunnies.